We’re on vacation hence, a slight departure from the usual vinegar, vinegar, vinegar for a few weeks. ‘Hope you enjoy the food observations. 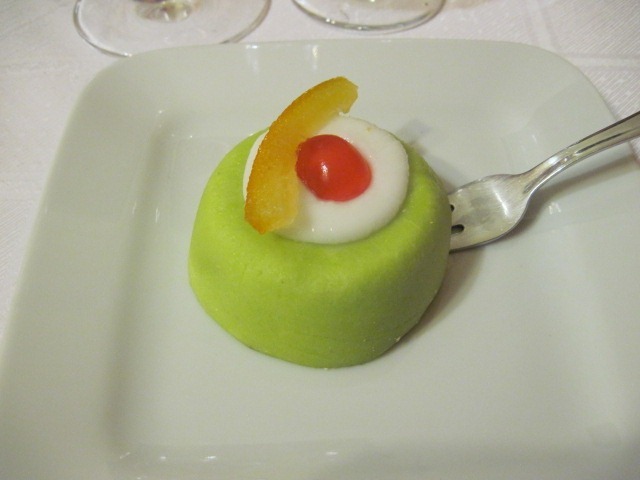 After ten days in Sicily, I have taken on the soft gooeyness of the Doughsbury Pillboy. 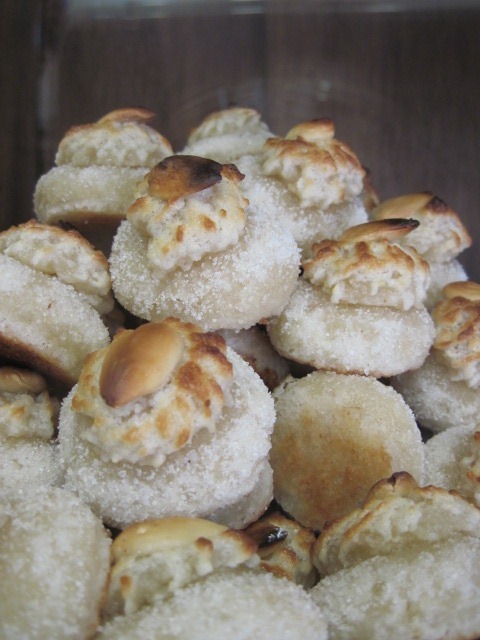 I have eaten more and varied pastries in the last few days than in the last ten years. 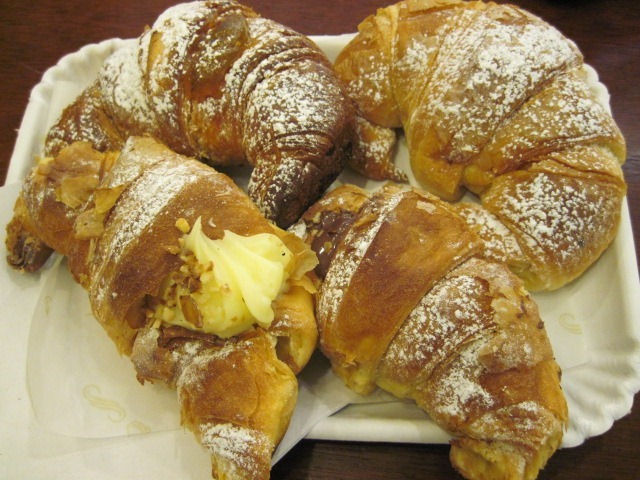 The mainstay of the Sicilian breakfast is pastry and pasticceria are easy to locate. 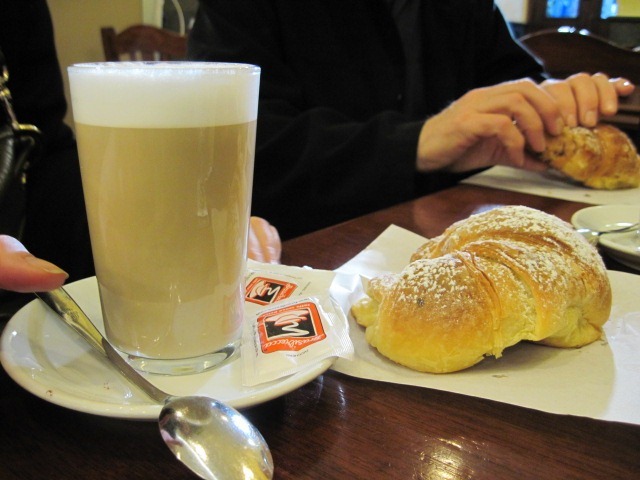 For the most part, breakfast consists of pastry and coffee or at least that has been my experience. Then, of course, there is the obligatory elevensies after a hard morning of visiting monuments. There is a lot to see in Sicily; Cathedrals, Parks, Monuments, Markets, Museums. About 11, you’re ready to sit down for a bit – and a bite. 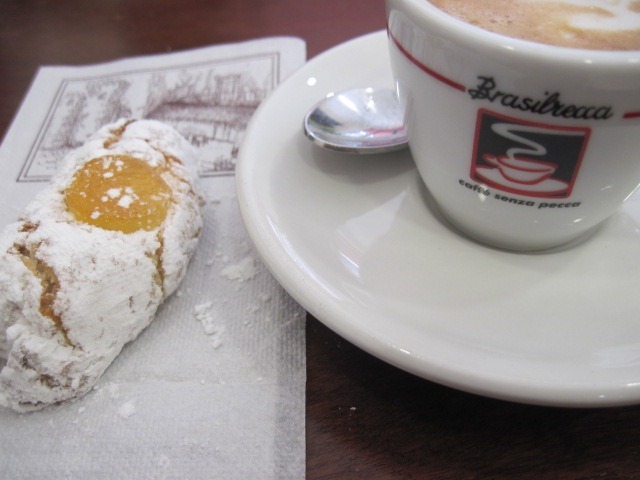 The coffee is dependably delicious everywhere, whether espresso, machhiato, Americano, cappucino. And it is traditionally consumed with a cookie. 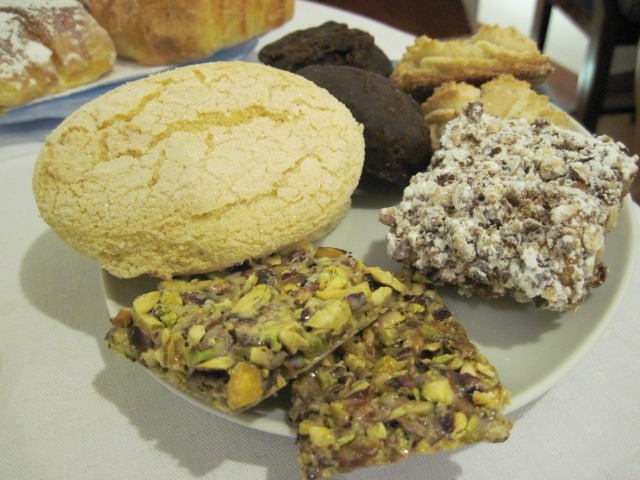 Cookies are many and varied in design, delicious, with almond, pistachio or sugar for garnish. One morning coffee break (much to my Canadian delight) donuts were the highlight! 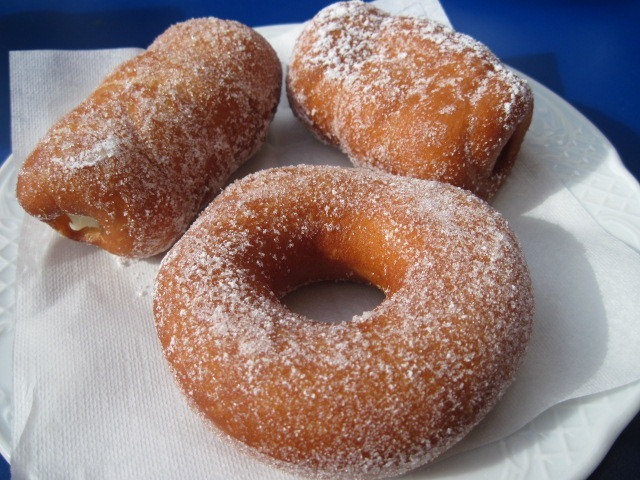 Not just any old donuts but Sicilian donuts. These were not the prefab rounds of that bastion of the Canadian traveler, Timmy Horton’s, but rather a delicious, deep fried, cream filled delight. They were light, airy and tender little morsels. This must be what heaven is like! 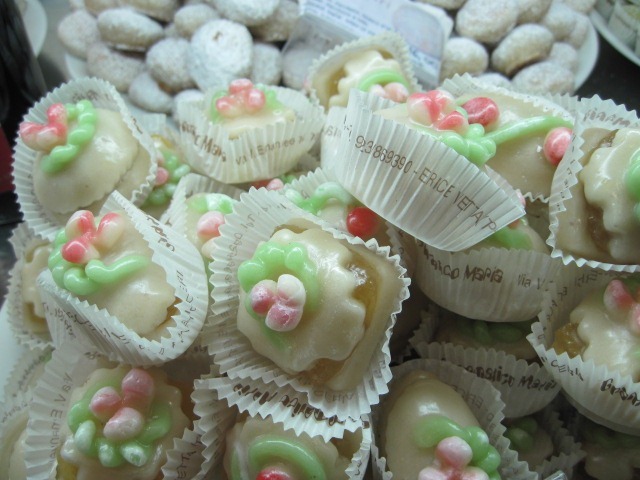 If donuts strike you as too pedestrian, there are the marzipan creations. 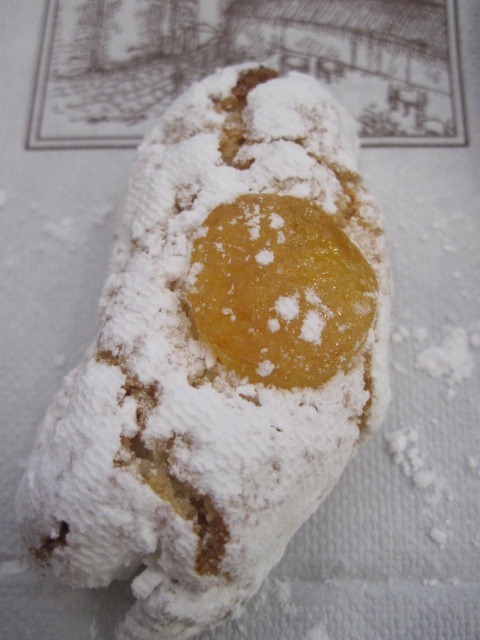 In Erice, depending on where you purchase them, these creations can be made by nuns. 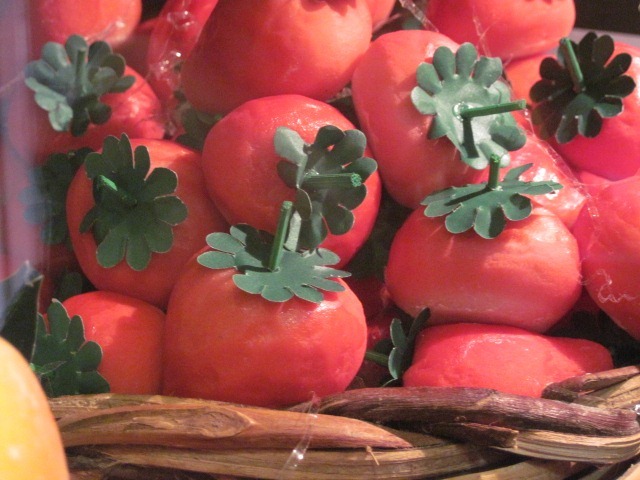 Tiny perfect replicas of various fruits, vegetables and nuts, together with little marzipan petite fours. 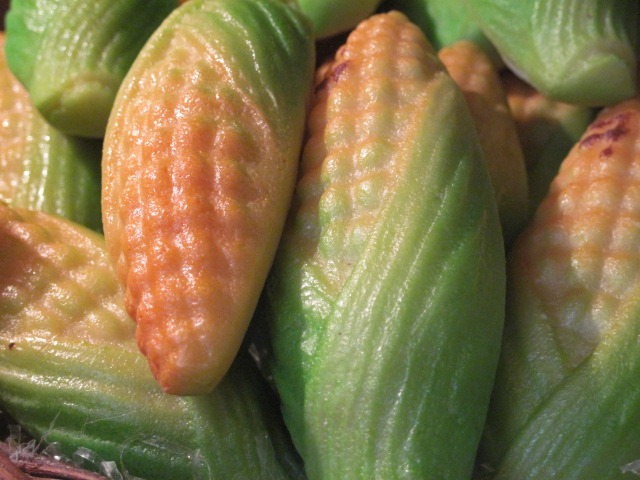 Why one would go to all this trouble to create, let say, the perfect marzipan replica of corn on the cob is not part of this discussion. Whatever the reason, they are delightful and whimsical. 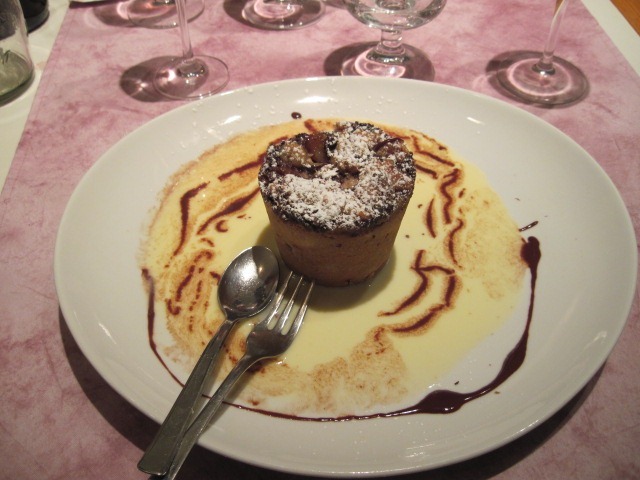 And if that is not enough, there are the desserts! 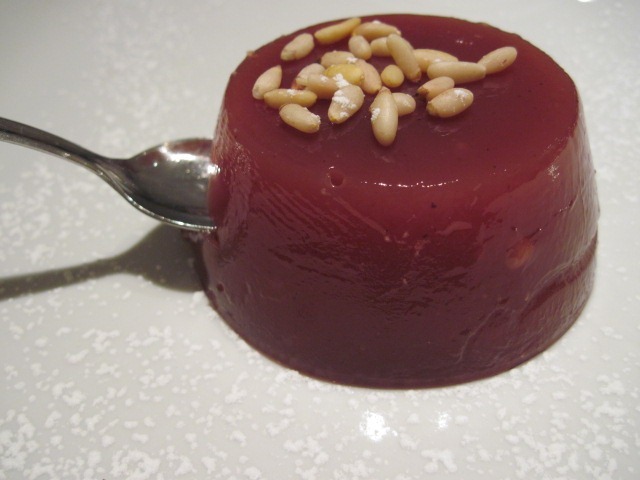 In Catania, we sample (from left to right); Chocolate Pear Timballo, Honey Cake, Baba Locange, and probably the strangest of the desserts served – Canelle (Cinnamon) Jelly. Our panel of dessert “experts” found the texture, flavour and presentation of the latter a bit lacking! 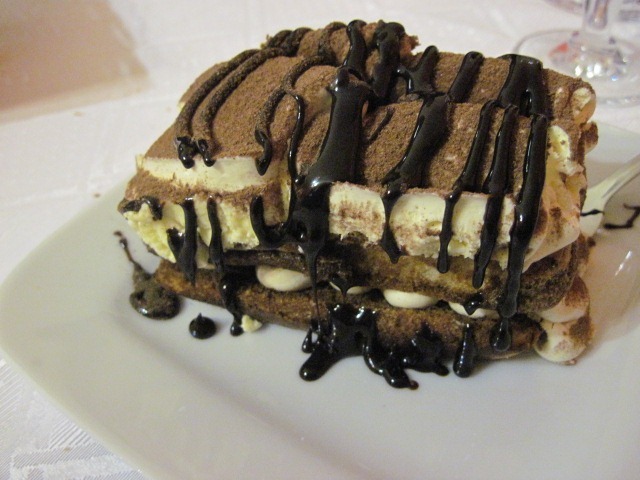 The next day, after that sugar rush wore off, we were back at it and found good examples of much loved Italian favourites; Cassata and Tiramisu. These examples deserved their “favourite” status! 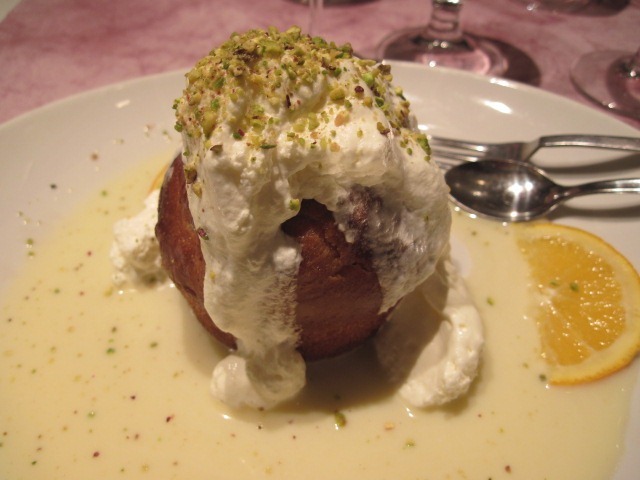 In Sicily the Cannoli is the queen of desserts. 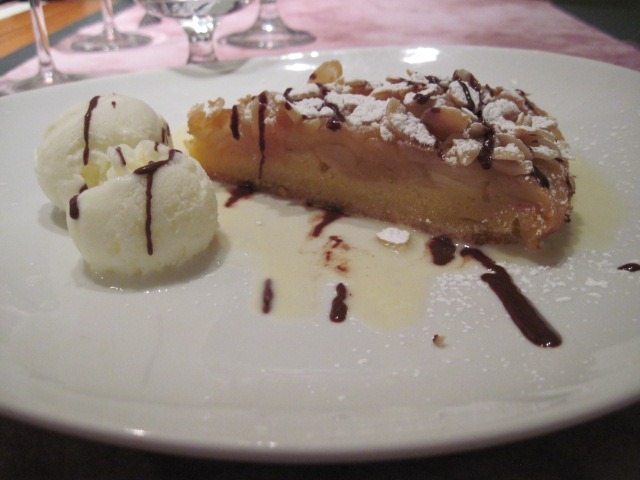 It is made with ricotta cheese and sugar rolled in a crepe shell. And, yes, the shells are deep fried. 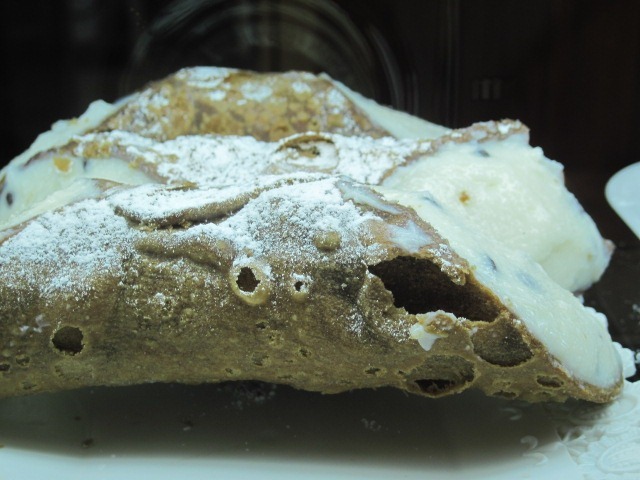 Cannoli vary in size, flavour and quality depending on which town you are in. 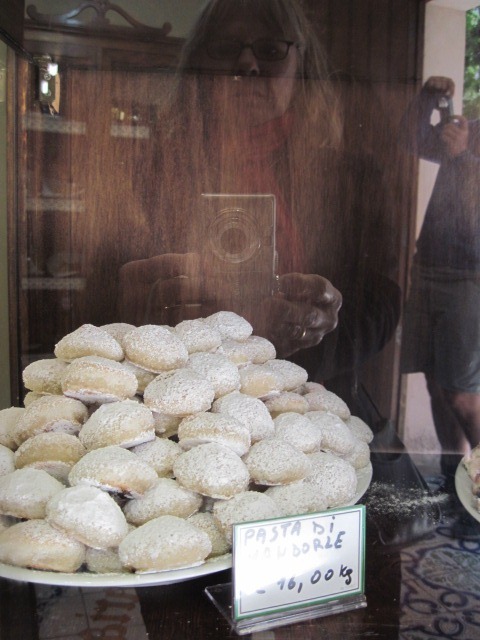 In Palermo, we shared a very large cannoli that was way too much cannoli. 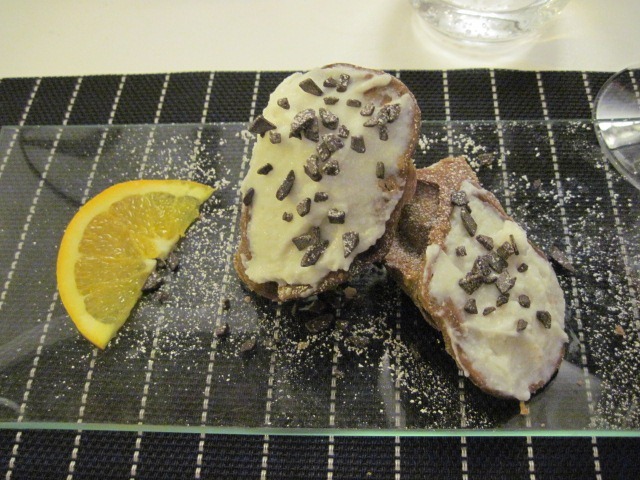 In Agrigento, dessert was a “deconstructed” cannoli. In reality it looked like a cannoli explosion. However, the combination of fresh ricotta and sugar is hard to resist. 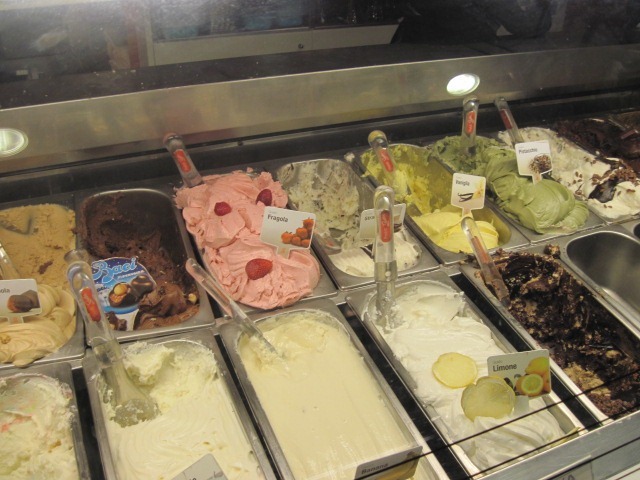 And, after dessert – gelato! 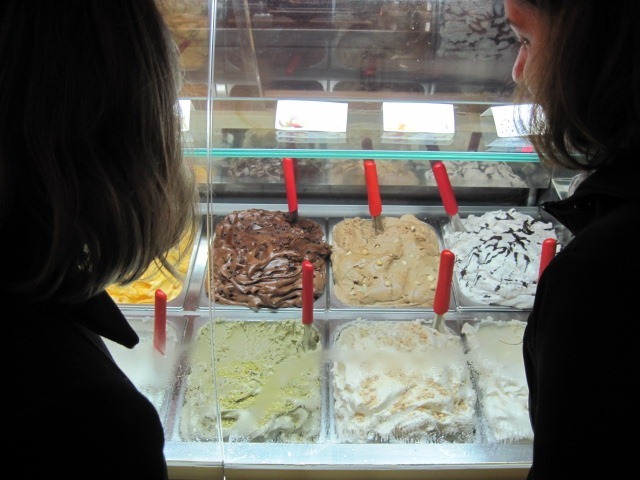 Gelaterias are everywhere. 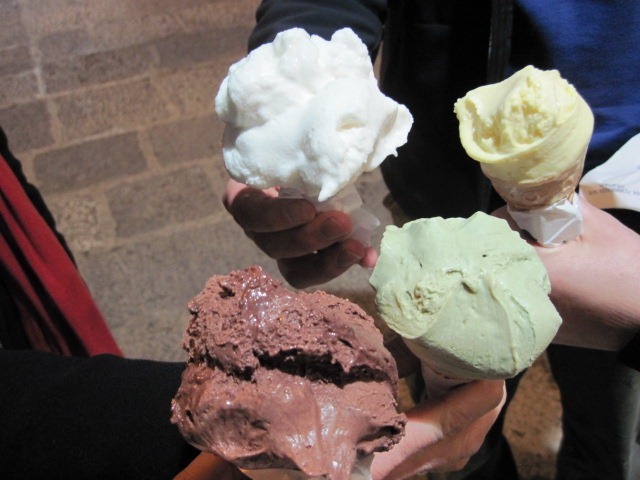 Sicilian gelato is a soft ice-cream with only six or seven per cent cream. What makes it different from North American style ice cream is less emulsifier, the way it is mixed and the way it is cooled. This creates a softer texture. 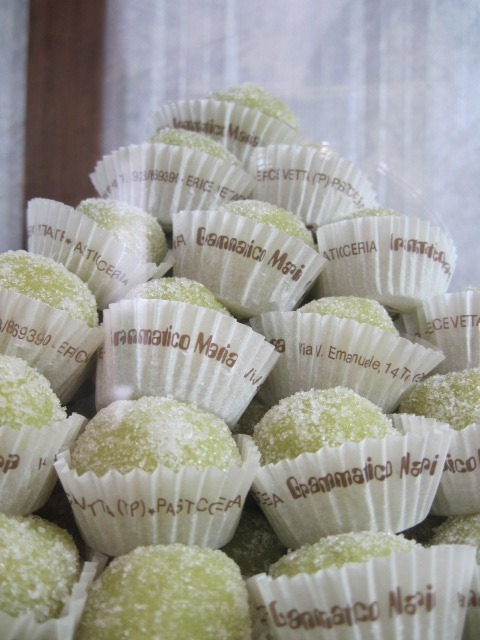 The flavours are intriguing; pistachio, dark chocolate, stracciatella (vanilla with dark chocolate pieces), lemon, jasmine and many, many more. 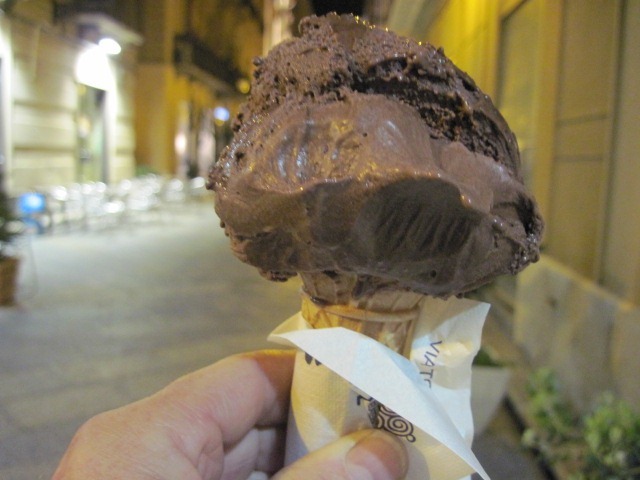 Typically, this is what you eat at the end of your passeggiata (the nightly stroll with friends), which occurs after the dinner at which you enjoyed antipasti, primi, secondi, carne or pesche, insalada, and dessert. Join me for antipasti, primi, secondi, carne and pesche, insalada. For the time being, I think the sweet end is covered! Love reading this blog Kim. Thanks. Sounds like you are having a great time and a good break from farming. I’m sure you’ll have plenty of opportunity to wear off the calories when you get home! Have fun with J&J when they get there. I am glad there are some readers out there! After being jacked up on coffee and pastries for several weeks, it will be difficult to come home, although, it is Christmas which means cookies, cakes, pastries and not to be forgotten, chocolate. I think we should be able to make the transition with out too much difficulty! She gets too hungry for dinner at eight….